Get ready to fight for your right to win in this entertaining video slot game. Have fun combating your way to the great prizes this Food Fight has to offer. Food Fight is a 5-reel game, and to view the pay table you must click on the "Pay Table" button located next to the red "Cash Out" button on the lower left side of the machine. It may be played in denominations of $.01, $.05, $.25, $.50, $1, and $5. The Food Fight as the name suggests is based on food fights that are heavily enjoyed by people. The online slot is a 5-reel online slot game. Combine your favorite foods and load up on ammunition for the food fight in this 5-reel slot game and win grand prizes on a gourmet spree. Play Now and get stuffed with winnings! The online slot is a 5-reel online slot game. Combine your favorite foods and load up on ammunition for the food fight in this 5-reel slot game and win grand prizes on a gourmet spree. With the same attributes as the 3 reel slot games, Food Fight video slot is an enhanced version of the slot game developed by RTG for an enticing online gaming experience. In order to excel in this game, make sure you end up with the right kind of food to fight your way through. The Food Fight bonus comes with three icons; a pie plate, a filling and a cherry. Spin these icons across the reels to trigger the bonus round. You will find a room with five characters in front of a blackboard. There are five pies ready to be flung on the woman holding a French book, a fretful man, a scared boffin, a rotund granny cook, and a long-haired hippy. Choose any one of them in any order and click to throw. Each successful hit will grant you some credits, but remember the game ends when you miss. Betting with maximum coins will bear better results even when you trigger the Ice cream scatter or Food Fight bonus rounds. Both these bonus rounds reward you an amount relative to your total bet on the spin. So, if you bet with maximum coins you can win up to 3,960 coins. The higher your bet, the better are the rewards that these bonuses will reel in for you. 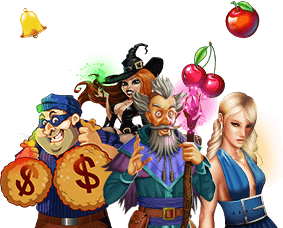 Playing Food Fight on our free slot games will also help you to increase your chances of winning when playing for real money. Reels: The section of the slot machine that spins when you press spin or pull the handle. They can be actual spinning reels as in land based casinos or video reels displayed on a screen. Bonus Feature: An additional way to win over and above matching symbols on the reels with a bonus feature to experience and make further wins.